Product SKU: 93351 ID: ps8. 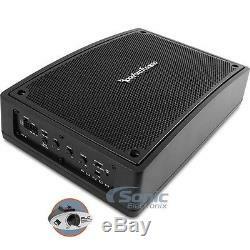 Rockford Fosgate Punch Powered Subwoofer Enclosure (PS-8). 300W 8 Punch Powered Under-Seat Loaded Subwoofer Enclosure with High & Low Level Input for OEM or Aftermarket Integration. Punch Single 8 Amplified Loaded Shallow Enclosure. Remote bass level control included. Includes all power, ground, and turn-on wires. CEA-2031 Compliant & Klippel Verified Driver. Cast aluminum wit an ABS backplate enclosure. Supports Hi-level (Speaker) / low-level (RCA) inputs. Remote/DC Offset/Signal Sense turn on select. Short circuit, thermal, and reverse polarity protection. Quick disconnect power and signal connections. "Closed-loop" design ensures optimum performance between woofer, amplifier and enclosure. Variable 12 dB/Octave Butterworth low pass crossover: 50 - 120 Hz. Frequency response: 25 - 150 Hz. Input sensitivity: 125mV - 9V. Dimensions: 9.40" W x 14.4" D x 3.30 H. Check out the Rockford Fosgate PS-8. THD at Rated RMS Power. Yes - with included adapter. Your new amplifier is going to need to receive the right power and ground connections to be powered correctly. These amplifier installation kits are the ideal solution for your amplifier. Complete 4 Gauge Amplifier Wiring Kit with 2-Channel RCA Interconnects (CCA Wiring). True Spec 4 Gauge Amp Installation Kit. Get the most sound out of your new subwoofer with some high quality sound dampening material. It will keep the road noise out and the music inside the car. Trunk Kit - 20 Square Feet of Sound Dampening Material (Five 18" x 32" Pieces). Trunk Kit with (5) Dynamat Extreme 18" x 32" Pieces. Boom Mat Damping Material (050210). Ft Damping Material - (10 pk - 12-1/2" x 24" x 2mm). Battery, charger, cords, straps, etc. We will not process the return if any of these conditions are not followed. Prices, specifications, and images are subject to change without notice. The item "Rockford Fosgate PS-8 300 Watt 8 Punch Amplified Powered Loaded Sub Enclosure" is in sale since Friday, September 30, 2016. This item is in the category "Consumer Electronics\Vehicle Electronics & GPS\Car Audio\Car Subwoofers".